Stuff Points: Earn 75 points when you buy this stuff. A large, flat rock is elevated at the top of the round bowl to create a simple and serene platform for the bamboo. A single shut is supported by another, and set at the perfect angle to direct water down into the pool below. Once filled with water, and operational, water will pump up the vertical shut, and then spill down the diagonal one to cascade as an endless stream into the bowl below. The long fall, and single, pouring stream will result in water sounds that are intense, and able to block out unwanted noise as they set the mood in any room. The materials look like they came straight from nature, but they're actually more durable and lightweight because this fountain is crafted from a strong fiberglass resin. You get a great natural look without any mess or heavy pieces, and at a much lower cost. A thick patch of faux grass shoots up from the water, and through the rock to add an interesting accent to one side of the fountain. It comes complete with a powerful pump, and it's backed by a one year warranty from the manufacturer. 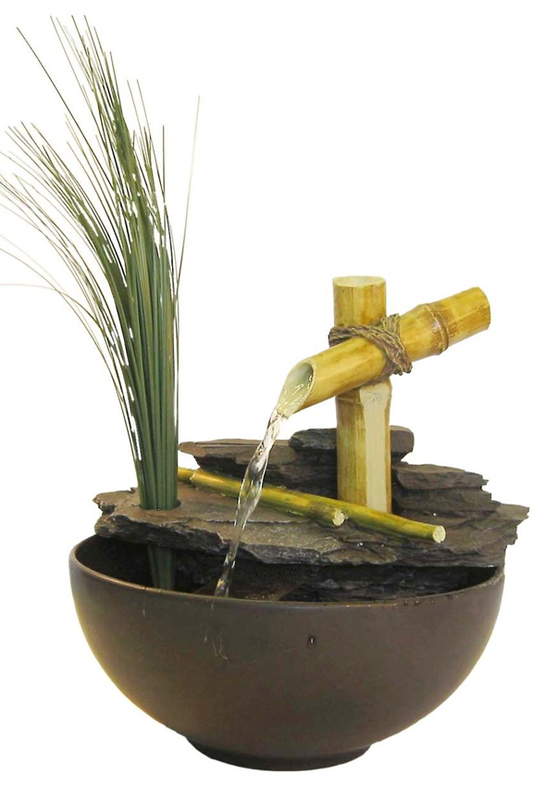 Add some peaceful serenity to your home with this simple, yet attractive water feature. Versatile. The material is durable, so place on any table, inside or out. Intense Sounds. The single stream, and long drop results in a unique and powerful running water effect. This model is 11 inches tall, and 10 inches wide on it's longest side. A single bamboo shut is propped up at the perfect angle. A long drop creates intense water noises to relax and block unwanted noises. Order Yours Today!